JAVA SE does not have any internal package for processing JSON data. We have to import an external library. There are many libraries available. You can choose any. I will use Json-simple1.1 here. This makes our first step, importing the lib. 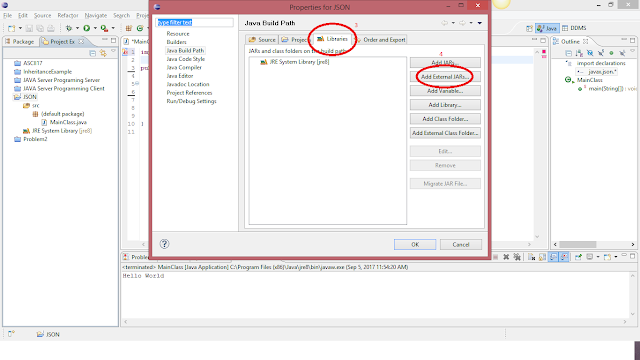 Click here and download the zip file containing the jar library and follow the following steps to import it into eclipse. 2. 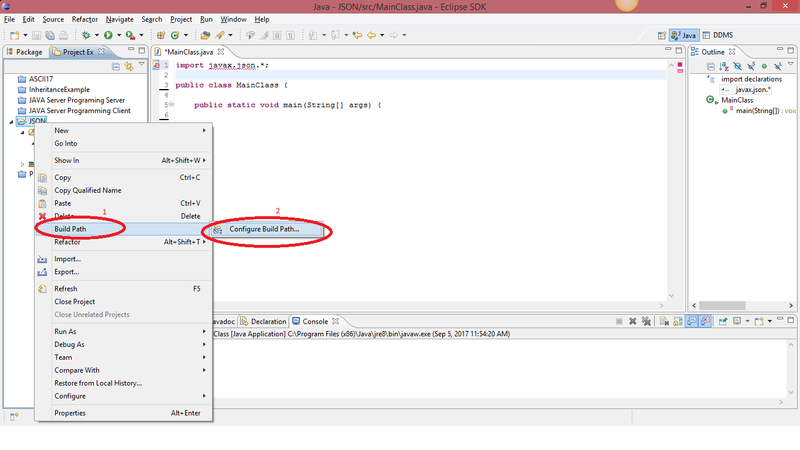 Right Click on the project folder in the package explorer, hover over Build Path and click on Configure Build Path. 3. You will see a nice window. Go to the Libraries tab and click on Add External JARs. 4. Navigate to the extracted jar folder, select the library and press open/ok. 5. Press ok again and you are done. The library contains parser and data structures to process the given JSON formatted string. The parser parses the JSON data from string/Reader to its own readable form. The data structures consist of JSONObject and JSONArray Classes which store JSON Objects and JSON Arrays respectively. The library has a bunch of other classes and methods but we will confine ourselves to only these three classes (JSONParser, JSONObject, JSONArray). Within these classes, we will use few methods. Why? Because it is just to get you started with JSON. Ok, Whatever. Let’s get started. public Object parse (String, ContainerHandler, Boolean);Above mentioned methods do the same work with different approaches. 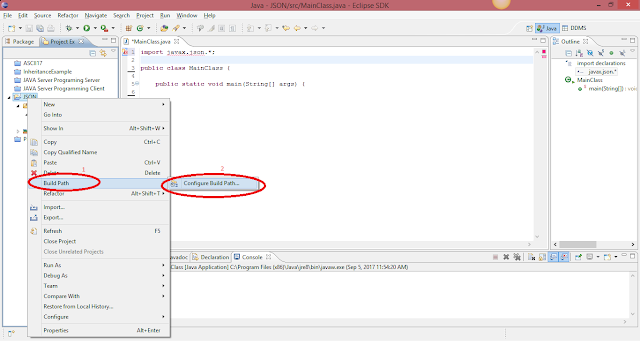 We will use parse (String) in our code just to make it work easily. public Boolean addAll (int, Collection) // to write a collection of entries at int index of a JSON arrayTo read from JSON you should know that the structure you are reading from JSON is whether a JSONObject or JSONArray and what is its name or index. We will have to pass this information in the get method. Get the full source project here. Give us your feedback by commenting and by participating in the survey. You are doing great, keep it up, see you in the next post. The particular selection includes parser and also info constructions to be able to method the particular offered JSON formatted stringed. The particular parser parses the particular JSON info coming from string/Reader to be able to a unique legible kind. The info Digital Ocean vs Aws constructions include JSONObject and also JSONArray Lessons which usually retailer JSON Things and also JSON Arrays respectively.